Think of a “robo-advisor” as a service that automates investing for you from the comfort of your home. Say you’re ready to invest, but don’t know where to start. You want professional guidance and advice, but prefer the convenience of using your laptop or smartphone to open an investment account online. You also want an easy, low-cost option. A robo-advisor gives you all of that. The “robo” part covers all the underlying software and tools used to help manage your account. But there’s always a team of professionals working behind the scenes to take care of the important stuff – choosing the securities, building a portfolio1, buying the investments, and rebalancing as needed. You simply get to sit back and watch your money grow. So what is RBC InvestEase? We would say we are more than just a robo-advisor. We provide an automated way to invest online, but we’re also backed by a team of RBC experts offering you support and advice as needed. 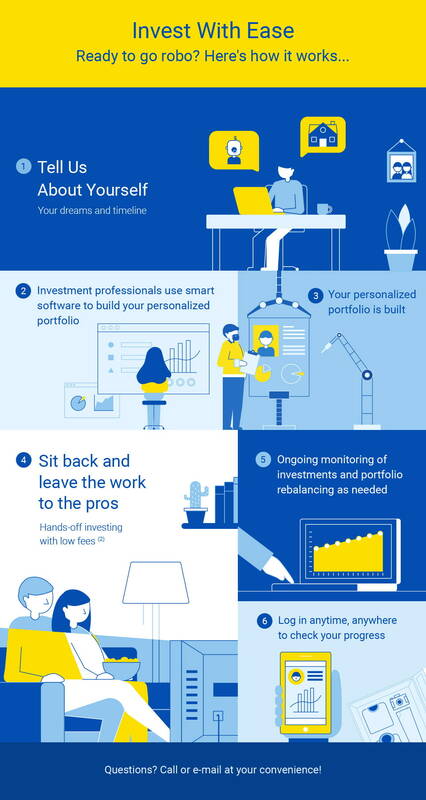 Call or email an RBC InvestEase Portfolio Advisor to find out more. An annual investment management fee of 0.50% + HST (billed monthly, based on your account’s average Assets Under Management) will be charged. In addition, a weighted average management expense ratio between 0.11-0.22% will also apply to the ETFs held in our portfolios.